Damage to traditional shellac varnishes — original varnishes made from shellac, and possibly with additional resins such as dammar, etc. — is often preventable. We see several common and preventable mistakes owners make over and over again. Before stripping, call a conservator, who may be able to repair or polish the damaged areas, saving the value of the antique! Inappropriate cleansers and polishers would be the number one cause of damage to traditional varnishes. Don’t assume a natural product is good for your finish. When in doubt use a damp cloth to clean, or Q-tips to remove dirt in edges and trims. No oils, no Pledge, no waxing every month. The most common damage is ammonia-based mirror cleaning products sprayed directly onto a mirror, and inadvertently landing on the wood surface surrounding the mirror. The damage done is extreme, shown above: large patches of craquelure or “crackle” so large as to look like alligator skin, hence the term “alligatoring.” Alligatoring happens first, and then the varnish begins to slough off in patches. This can be repaired through a process of liquifying and adding to the shellac, as you can see from the second image. If you need to clean a mirror, spray the rag with the ammonia away from the piece, then turn and clean the mirror with the rag. Perfume, nail polish, creams, alcohol and even alcoholic drinks are the next set of damage producing products. Also, the small atomizers for air fresheners, and essential oils diffusers. These should be handled with care, and a completely enclosed tray (no holes at the edges) should be used to keep the possible offenders from hitting the finish. A cosmetic spill was responsible for this complete loss of shellac varnish, probably perfume. Extreme damage on a Greek Empire Chest of Drawers, all from cosmetics. 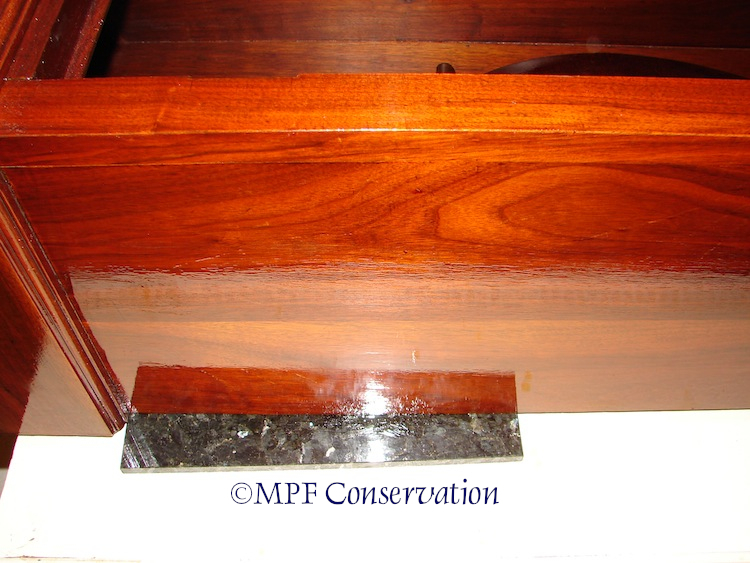 A lengthy cleaning and buildup of additional matching shellac restored the original finish. Shellac is not fond of hot plates, but the wonderful thing about true shellac (not the modern products called shellac) it that it can usually be rubbed out, as you can see before and after, below. A trivet can keep these white spots from happening. Heat Damage is one of the common causes of finish on dining tables. After treatment, several large white marks disappeared. Plastic wrap around true shellac, especially when combined with the heat in a moving van, cuts deeply into the shellac. In the grandfather clock below, it created a taffeta effect. We had to re-liquify the original shellac, then add matching shellac (not modern, but our own recipe) to repair. Never wrap any antique in plastic! Side of the clock wraped in plastic arriving in Oregon. The plastic embedded into the shellac in the heat of the truck. We re-liquified and added to the shellac to repair. Food, grease, wax candles, can eventually eat into shellac. Cleaning up spills and thoroughly cleaning after events can prevent this damage, because shellac is quite hardy. Below, an extremely damaged buffet is brought back to life with a mechado process. Candle wax and foods left impressions on this well-used family Arts & Crafts Buffet. The original finish was cleaned thoroughly, and then shellac was added as infill and the top was finished with a mechado process. This entry was posted in antiques, CAUTIONS, conservation techniques, preservation, reparation, restoration techniques, shellac, traditional varnishes, waxes, wooden objects and tagged antique care, antique shellac varnish, caring for your treasure, damage. Bookmark the permalink. Antiques are a big part of the culture down here in south Louisiana, especially at bed and breakfasts like The Cajun Village Cottages. 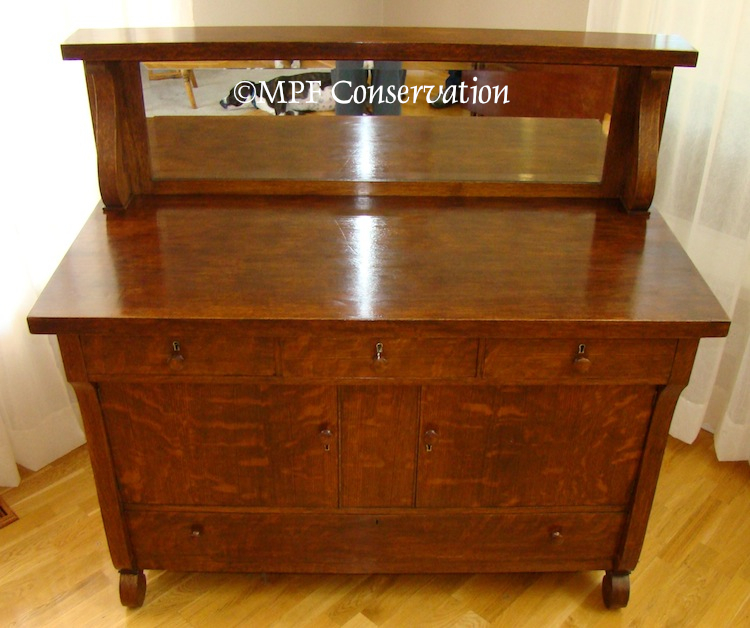 Mpfconservation has great antique restoration tips and information! I don’t know how I missed your reblog!